There are many aspects to consider when choosing the best audio interface for live performances. With hundreds of model of audio interface to choose from, and several reliable brands to favour, how do you go about choosing which brand and model of interface is right for you? Well, we’ve tried our very best to lay out all of the information below, based on your requirements of the audio interface itself, in a live environment. These requirements should be applied to all audio interfaces for live performances, however, what about the more specific requirements that you may have, such as the number of inputs and outputs… Well we’re going to split the following recommendations by the number of outputs available. 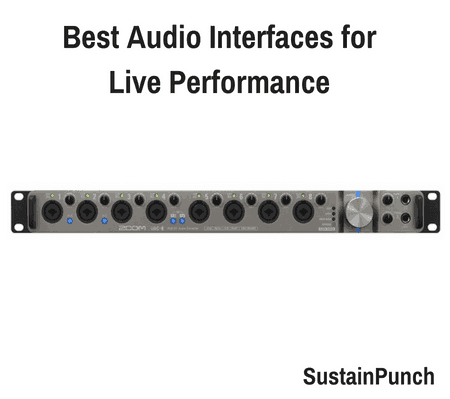 Within each category described above, we will be providing the best audio interfaces for live performances within different price ranges, so you can find the certain interface which matches your technical requirements and your budget. The UR22mkII is the perfect low budget audio interface for live performances; With it’s compact design and steel casing, it’s a device which can take a few knocks. The UR22mkII audio interface provides the same high quality performance selling points as it’s bigger siblings… with premium quality D-PRE preamps, phantom power and Hi-Z input for guitar and bass recordings, alongside 24-bit resolution/192kHz sample rate sound quality. Another nice feature of the UR22mkII for live performances is the monitoring architecture, with an independent headphone output control, meaning that the engineer can isolate his/her output volume. The interface also has a MIDI input and output for your drum machine, synth or MIDI controller and benefits from being able to be powered by the built-in USB 2.0 port or a 5v DC power supply, a choice which can be dictated by the sound engineer. Compatibility : Not only can the UR22mkII be used on Mac and PC, but with it’s CC mode and external power input, it’s also compatible with iPad and iPhone. 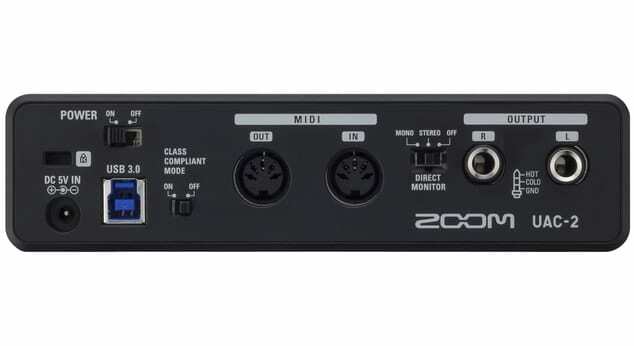 The Zoom UAC-2 is quickly becoming the gold standard of low-cost audio interface for live performance, with it providing a high quality sound with super low latency. The interface is bus-powered with two channels of inputs, with 24-bit resolution and 192kHz sample rate for sound quality. However, the device really excels in it’s connectivity, with USB 3.0 SuperSpeed technology for ultra-low latency and offering advanced features such as 4 x up-sampling, loopback and MIDI input and output. Compatibility: The audio interface is compatible with Mac/PC/iPhone and iPad. The RME Babyface Pro is the creme de la creme audio interface. The device demonstrates the latest innovations within the industry, incorporating newly designed analog and digital circuits, because of this, the audio interface doesn’t compromise on sound quality or levels, with minimal signal interruption or diminishment. Offering 12 Input and 12 output channels, including 4 Analog inputs (Mic, Line, Instrument), 4 Outputs (2 XLR and 2 Phones) 1 ADAT I/O or 1 SPDIF I/O, 1 MIDI I/O and USB 2.0/3.0 connectivity. At this price-point, you expect this level of quality, and we would recommend that you only purchase this device if you’re looking for nothing less than perfection; otherwise the Zoom UAC-2 is a perfectly good follow-up option. iConnectivity’s iConnectAUDIO4+ is a 4 input (XLR and 1/4 inch line) 24-bit/96kHz AD/DA conversion audio interface with MIDI input/output functionality. The audio interface comes with iConfig software, which is stored in flash memory on the device. This enables the engineer to easily set up filtering, routing and merging scenes. Highly versatile in it’s use, the rear panel of the iConnectAUDIO4+ has a lot of unique features, not seen on other audio interfaces at this price-point. For example, the 2 USB-B ports make it possible for the user to connect two different hosts (Mac, iPad, PC, etc) and allows for audio to be routed between these devices. Additionally, there is a USB-A port which can be used to connect external MIDI devices and interfaces, such as vocal effects pedals, i.e vocal harmony pedals. The RME Fireface UC is a professional, compact audio interface with 6 line outputs. The interface demonstrates incredibly low latencies, with the smallest buffer being 48 samples on Windows and 14 samples on Mac OS X 14; This may vary when multiple channels are engaged, but it gives a great indication of the fantastic quality of the hardware. This kind of minimal latency is most likely accredited to the RME Hammerfall core within the RME Fireface UC, and not only for the fact for German engineering. The rear of this premium device boasts some nice features, with an on/off switch, options for bus-power (USB 2.0) or a powering plug, MIDI I/O, ADAT I/O, SPDIF I/O, Word Clock I/O. 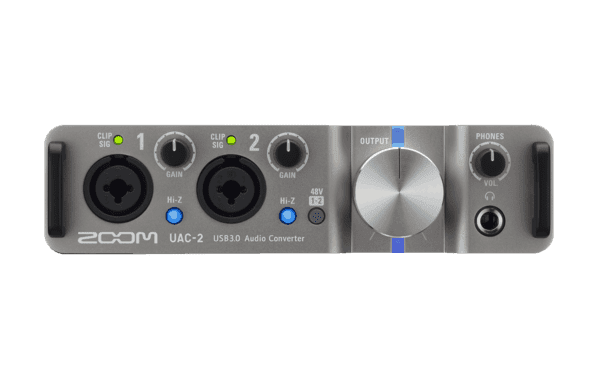 The Zoom UAC-8 is in the same series as the UAC-2 which we’ve talked about, the only major difference being the amount of inputs/outputs available, with the UAC-8 having 8 Line Inputs/Outputs. The devices are very similar in physical appearance, with the UAC-8 having the same metal chassis, which is rack-mountable. The device uses USB 3.0 SuperSpeed transfer protocol, which is 10x faster than USB 2.0 and 6x faster than Firewire 800. This connectivity helps ensure that the device provides low latency. The device can provide a frequency range of 96kHz / and sample rate of 32 samples. For the price, this is a fantastic option! Especially considering other devices (with less inputs/outputs) such as the RME Fireface UC are more expensive. Being able to achieve sample rates of 24 bits and 192kHz, you know that it can deliver that high quality live sound you’re after. With 48v Phantom power, which is able to be isolated to an individual input, it’s especially good for live performances which include active and passive microphones. 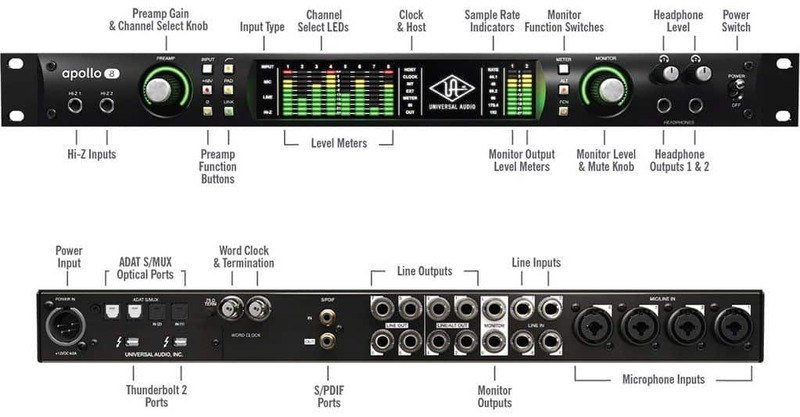 The device boasts MIDI I/O and ADAT connectivity, alongside 10 line outputs in total (8 analog, 2 main) and is powered by a 15v DC power supply. 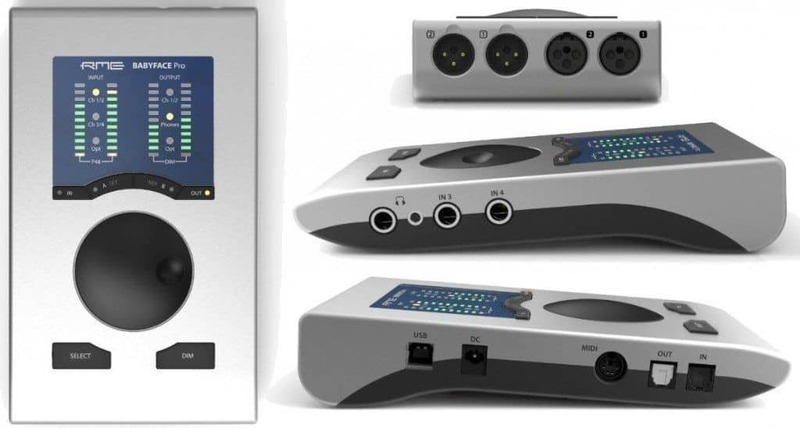 All in all, a very solid, compact audio interface for live performances and studio recording. Bonus – The device settings (volumes, effects) can be altered remotely using the MOTU Discovery software by multiple users on mobile devices (tablets/phones) as long as they have access to a browser, and therefore this can be handy if multiple sound engineers are making changes based on their position within the venue. 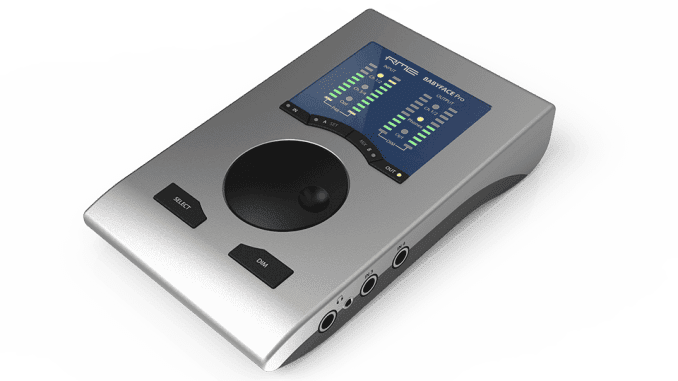 The RME Fireface audio interface is a go-to for many professional live events and gigs, with many broadcasting and agencies specifying this particular model. The interface has 12 analog I/Os. 12 Outputs . 8 balanced line outputs on the back, and 2 hi-power line stereo phone outputs. As the price-tag is particularly high, we advise giving some serious thought to whether or not you will need this caliber of interface. Only the alternative would be to purchase a less expensive interface, and put money into bettering sample libraries and connectivity equipment, which will have a tremendous impact on the overall sound quality of the live system. The Universal Audio Apollo 8 interface does not have MIDI I/O functionality. However, it does have a certain use case. UAD is a company which is known for making great software plugins which are modelled after iconic hardware and vintage gear. These particular plugins run on DSP chips, which is an acronym for Digital signal processing; These chips are embedded within the Apollo 8 interface, and therefore allows the interface to free up your computer’s processing power (particularly helpful if you are someone who wants to be able to use a lot of effects during a live performance. The Apollo 8 has Thunderbolt connectivity, two main outputs alongside 8 line outputs. It also features a word clocks, ADAT and S/PDIF connectors. The MOTU 16A’s main advantage over other audio interfaces, especially in a live performance environment is that it keeps latency to an absolute minimum (a handful of samples at most). It achieves this through the Thunderbolt connectivity, which only has a 1.4ms round-trip latency time.